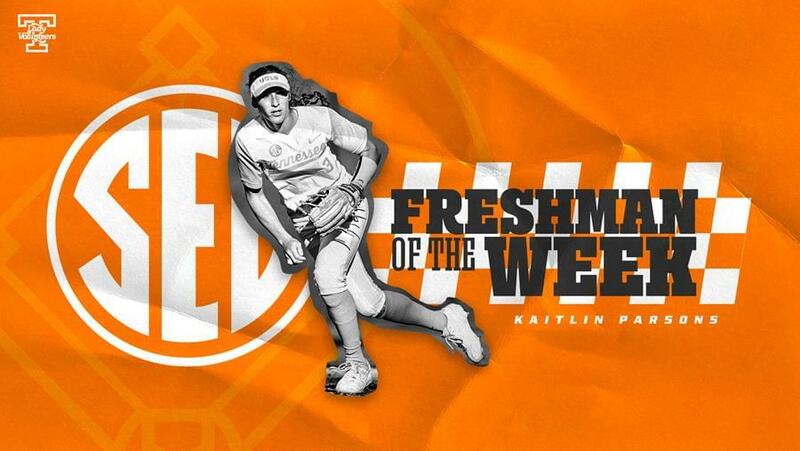 BIRMINGHAM, Ala. – Freshman designated player and infielder Kaitlin Parsons was named the SEC Freshman of the Week as announced by the conference office on Tuesday. The Long Beach, Calif., native led the Lady Vols on the weekend with a .571 batting average (4-for-7) against Mississippi State. Parsons proved instrumental in Tennessee’s sweep of MSU, scoring four runs, including three in the series finale while driving in four more. She accounted for three of UT’s four runs in the series opener. Parsons notched RBI hits in back-to-back at-bats, including her first-career triple, and then scored in the fifth inning to give the Orange and White a 3-0 lead. On the weekend, she reached base nine out of 11 times thanks to hits, walks, an MSU error and a fielder’s choice. Overall, her .857 slugging percentage, .700 on-base percentage, four runs, four hits, and four RBI also paced the team in addition to her batting average. 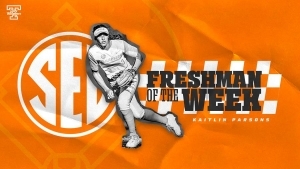 This is Parsons’ first-career SEC Freshman of the Week honor and the second for a Tennessee freshman this season as Ashley Rogers was tabbed SEC Freshman of the Week on April 2.